Last night’s State of the Union address is available from the White House press office. But what about prior addresses? For one-stop shopping, check out The American Presidency Project, an online searchable archive maintained by UC Santa Barbara. It includes executive orders, proclamations, signing statements, veto messages - and every State of the Union delivered to Congress since 1790. A few fun (and possibly useful) lists such as length in words and length in minutes are included. For more on Presidential Documents, see our research guide. In case you haven't heard, big changes are coming to LexisNexis and Westlaw. See the article on the ABA Journal website: Inside the New Westlaw, Lexis & Bloomberg Platforms. Both companies claim to be creating a legal research experience that will mimic the ease of use their customers have come to expect from the leading Internet search engine, Google. You can check out other reports on these developments in the New York Times Technology section for Jan. 24th and Robert Ambrogi's LawSites blog for Jan. 26th. But don't expect these new interfaces to appear on a monitor near you soon. The law firm market is likely to be offered these "upgrades" first. Yesterday a task force of the House of Representatives voted in favor of four articles of impeachment against Judge G. Thomas Porteous, Jr., Eastern District of Louisiana. The articles allege an improper financial relationship with a firm that handled a case before him, the failure to recuse himself in a case the firm handled, and more. Judge, Facing Impeachment, Mounts His Defense, The BLT: The Blog of the Legal Times, Jan. 22, 2010. Impeaching a federal judge is very unusual. The Federal Judicial Center has a list of all the judicial impeachments from 1803 to 2009 -- just 14 in all. Only 7 of the judges were convicted. The Federal Judicial Center offers a database that enables you to search profiles of all federal judges in history by characteristics such as nominating president, race or ethnicity, and -- a search I just tried -- termination reason. LexisNexis is now providing the academic market limited access to CourtLink. CourtLink is a docket/document retrieval and e-filing product containing millions of state and federal case dockets, briefs, motions, and complaints. For now, academic subscribers can access over six million of the 85 million documents available to commercial customers. Washington-specific documents are limited to those filed in these federal courts: U.S. District Court, U.S. Bankruptcy Court, and the Ninth Circuit Court of Appeals. Washington state court dockets/documents are not available. One way to find CourtLink: log in to Lexis at www.lexisnexis.com/lawschool and click Research Now to enter the research system. From the Legal tab, click on the heading Court Records, Briefs and Filings. On the next screen, click on the heading Court Records. Finally, click on the link for Litigant, Attorney & Judge Strategic Profiles. This opens a new window into CourtLink. One of the new features now available is the Single Search box where you can enter a terms & connectors search to find your specific topic. Once you get to the results, there will be two tabs: one for dockets and one for documents. After entering your term(s) in the single search box, you can then refine your search results on the left hand side by choosing case type, litigation area, state or date filed. You can narrow your results by entering a keyword in the “Search within Results” box. The dockets currently do not provide live links to the documents listed. U.S. District Court for the Eastern District of Washington: civil documents back to 1986; criminal documents back to 1992. U.S. District Court for the Western District of Washington: civil documents back to 1987; criminal documents back to 1991. Bankruptcy Court for the Eastern District of Washington: back to 1988. Bankruptcy Court for the Western District of Washington: back to 1992. Also, the U.S. Court of Appeals, 9th Circuit (including the Bankruptcy Appellate Panel) has documents back to 2000. On one morning, members of a drug task force arrested forty-seven people for dealing cocaine. Forty-seven is a lot of drug dealers for a town of 5,000 people, and some people might have been struck by the coincidence that not one of them had cocaine when the surprise busts were made. But still, prosecutions went ahead and most of the suspects were convicted and given substantial sentences. In Tulia: Race, Cocaine, and Corruption in a Small Texas Town (HV8079.N3 B55 2005 at Good Reads) reporter Nate Blakeslee explores all the things that went wrong -- the dishonest undercover cop, the sheriff who ignored repeated warning signs (even an indictment of the cop for theft from another county), the prosecutor who pressed on and stonewalled anything negative, the court-appointed counsel who didn't do much, the judge who didn't let the defense attorneys question the cop's background, the newspaper who assumed the guilt of all charged, the white community that was eager to believe the worst of the black defendants. He also explores some things that went right -- a few community members (white and black) who advocated for the defendants, sending out mailings to get some media attention, the Texas Observer story (written by Blakeslee), the national media coverage, the New York drug reform advocate, attorneys from Texas, DC, and New York who handled the habeas case and civil suits. Blakeslee followed the events in Tulia after his first magazine article. He attended court hearings, interviewed defendants and family members, and pored over trial transcripts. He brings to this legal tale background about the community and the families entangled in the arrests. Blakeslee gives an inside view of the legal maneuverings -- the judge's decisions to exclude certain evidence from the original trials, the different level of investigation by the different court-appointed attorneys, the involvement of the Texas ACLU (search for "tulia" to learn about advocacy related to the case), the litigation strategy of the habeas team, and some beautiful cross-examination in the habeas hearing. The habeas team was spearheaded by Vanita Gupta, a young lawyer at the NAACP Legal Defense Fund, fresh out of law school and funded by a Soros fellowship. She threw herself into the case and recruited the "dream team" of lawyers from DC and New York law firms. * Blakeslee had access to the team and so could write with immediacy of the "war room" discussions and the teamwork involved in the litigation. Behind one lawyer's brilliant cross-examination, for instance, was another lawyer's painstaking work culling through transcripts to find the undercover officer's previous misstatements. Blakeslee makes it clear that he does not think that the injustice in Tulia is unique to that time and place, and he discusses more general issues about multi-jurisdictional drug task forces and the indigent defense system. In a closing chapter, he reports some reforms implemented in Texas in response to the Tulia events. You can preview Tulia on Google Books, and of course you can check the whole book out from the library. * For profiles of and interviews with Gupta see New York Times (April 16, 2003), NYU Law (Jan. 2004)), Rediff India Abroad (Dec. 8, 2004), and Wikipedia. Earlier this month, I attended the annual meeting of the Association of American Law Schools. Partly because the meeting was in New Orleans, the Section on Children and the Law organized a day-long program, "Meeting the Needs of Children During Times of Crisis: Hurricane Katrina and Beyond." One speaker (Anna Williams Shavers) remarked that disasters have a more severe impact on people already disadvantaged or suffering injustice, and disasters can also serve to reveal existing injustice. Her focus was public education in New Orleans -- but the same is true in Haiti. The natural disaster is hitting hard in a community already suffering from poverty and years of unstable governments, and the disaster is bringing the underlying situation to the world's attention. 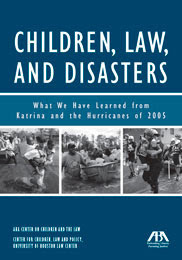 symposium on Hurricane Katrina, 31 Thurgood Marshall Law Review 327-572 (2006), available on HeinOnline -- table of contents here. Juvenile Justice Project of Louisiana, Treated Like Trash: Juvenile Detention in New Orleans Before, During, and After Hurricane Katrina. When presented with a bill passed by Congress, the President of the U.S. may sign it into law, veto it, or send it back to Congress. As with any situation, the President may also take no action. Usually, if the President takes no action then the law becomes effective without his signature. However, if the Congress isn't in session when the President's time limit to return the bill to Congress expires -- the bill dies. This so-called "pocket veto" is specifically enumerated in Art. I, Sec. 7, Cl. 2 of the Constitution. The New York times also reports that Congress voted last week on an effort to override that veto. The override attempt is a surprising move -- given the bill's substance was moot and any general procedural changes to the pocket veto would likely require changing the text of the constitution. For a detailed look into the pocket veto (or any other provision of the Constitution, for that matter) check out "Constitution of the United States of America: Analysis & Interpretation." This meaty tome is an annotated version of the U.S. Constitution prepared by the Congressional Research Service of the Library of Congress. As a government document it is available online through the government printing office (GPO). But to get a sense of the hefty consideration the Constitution has had over the years you can find it in the Reference area and the Reference Office. The American Law Institute (A.L.I.) produces restatements of the law, model codes, and principles of law. This group of lawyers, judges, academics, and law librarians deliberatively comments on both what the law is and what the law should be. Notably, the ALI promoted their model penal code for adoption by the fifty states. With many variations and exceptions, they were largely successful. The ALI membership in the 1960's included in the model penal code provisions detailing and implicitly ratifying the death penalty. As the New York Times reported last week, the ALI voted last year to withdraw the model code's sections concerning capital punishment. The vote followed from the ALI's report on the death penalty, available here in pdf. In the past few years, I have adhered to the tradition that Chief Justice Burger initiated and have provided my perspective on the most critical needs of the judiciary. Many of those needs remain to be addressed. This year, however, when the political branches are faced with so many difficult issues, and when so many of our fellow citizens have been touched by hardship, the public might welcome a year-end report limited to what is essential: The courts are operating soundly, and the nation’s dedicated federal judges are conscientiously discharging their duties. If you want to read reports from other years, visit the Supreme Court’s website, where you will find the year-end reports back to 2000. Thomas, the free website of Congressional information provided by the Library of Congress, has been recently enhanced. The five most-searched-for bills from the past week are listed in the center box on the right side of the homepage. Hovering the mouse over the bill number will display the title of the bill. The top bill this week is the Patient Protection and Affordable Care Act, the big health reform bill. Users may select an RSS feed for information about bills that are awaiting the President's signature. PDF images of bills have been are now easier to find. A glossary of terms and a table of cases is also included. The Federal Judicial Center is the research and education agency of the federal judicial system. The National Institute of Military Justice, a nonprofit associated with American University Washington College of Law had compiled and published “every publicly available decision, order, and ruling issued by the military commissions conducted at the U.S. Naval Base, Guantánamo Bay, Cuba, and all known substantive opinions and rulings of the United States Court of Military Commission Review from October 2006 through June 1, 2009.” The hard copy version is available at KF7661.N38 2009 at Reference Area. You can download the PDF from the NIMJ publications page. The publications page also includes the first supplement (which will be compiled “in due course”) and NIMJ’s 4-volume Military Commission Instructions Sourcebook. Judge Patricia Wald’s 9-page Foreword to this first volume of the Military Commission Reporter was reprinted in the Green Bag.